“What does it mean to make a promise? In an age where the ‘promise of the future’ has become something of a cliché, what is meant by The Future of a Promise? In its most basic sense, a promise is the manifestation of an intention to act or, indeed, the intention to refrain from acting in a specified way. A commitment is made on behalf of the promisee which suggests hope, expectation, and the assurance of a future deed committed to the best interests of all. A promise, in sum, opens up a horizon of future possibilities, be they aesthetic, political, historical, social or indeed, critical. ‘The future of a promise’ aims to explore the nature of the promise as a form of aesthetic and socio-political transaction and how it is made manifest in contemporary visual culture in the Arab world today. In a basic sense, there is a degree of promise in the way in which an idea is made manifest in a formal, visual context – the ‘promise’, that is, of potential meaning emerging in an artwork and its opening up to interpretation. There is also the ‘transaction’ between what the artist had in mind and the future (if not legacy) of that creative promise and the viewer. Whilst the artists included here are not representative of a movement as such, they do seek to engage with a singular issue in the Middle East today: who gets to represent the present-day realities and promise of the region and the horizons to which they aspire? The participating artists are Ziad Abillama (Lebanon), Ahmed Alsoudani (Iraq, zie ook see also this ealier contribuition) Ziad Antar (Lebanon), Jananne Al-Ani (Iraq), Kader Attia (Algeria/France), Ayman Baalbaki (Lebanon), Fayçal Baghriche (Algeria), Lara Baladi (Lebanon), Yto Barrada (France, Morocco), Taysir Batniyi (Palestine), Abdelkader Benchamma (France/Algeria), Manal Aldowayan (Saudi Arabia), Mounir Fatmi (Morocco, see this earlier contribution), Abdulnasser Gharem (Saudi Arabia), Mona Hatoum (Palestine/Lebanon), Raafat Ishak (Egypt), Emily Jacir (Palestine), Nadia Kaabi-Linke (Tunesia), Yazan Khalili (Palestine), Ahmed Mater (Saudi Arabia, see this earlier contribution), Driss Ouadahi (Algeria/Morocco) en Ayman Yossri Daydban (Saudi Arabia). 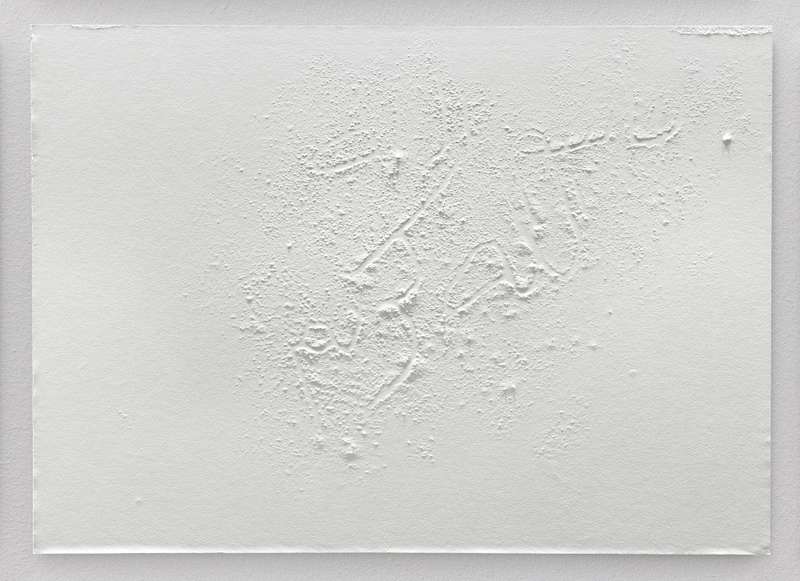 ‘Hatoum’s work is the presentation of identity as unable to identify with itself, but nevertheless grappling the notion (perhaps only the ghost) of identity to itself. 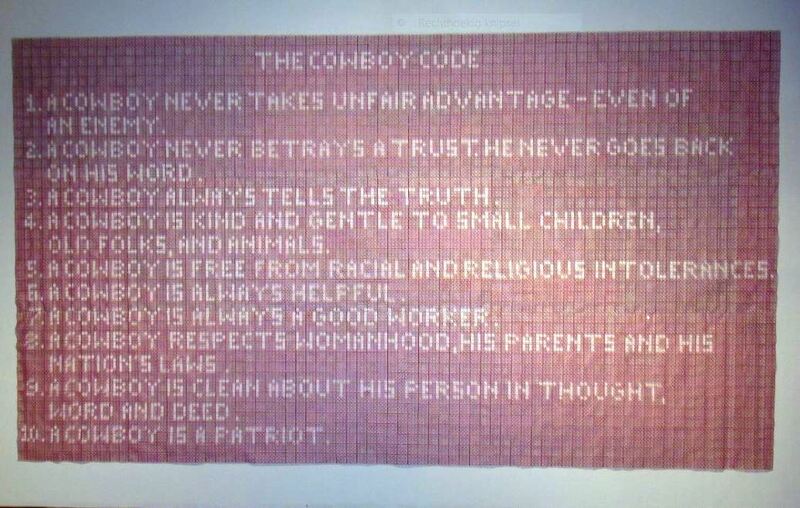 Thus is exiled figured and plotted in the objects she creates (Said, “Art of displacement” 17). 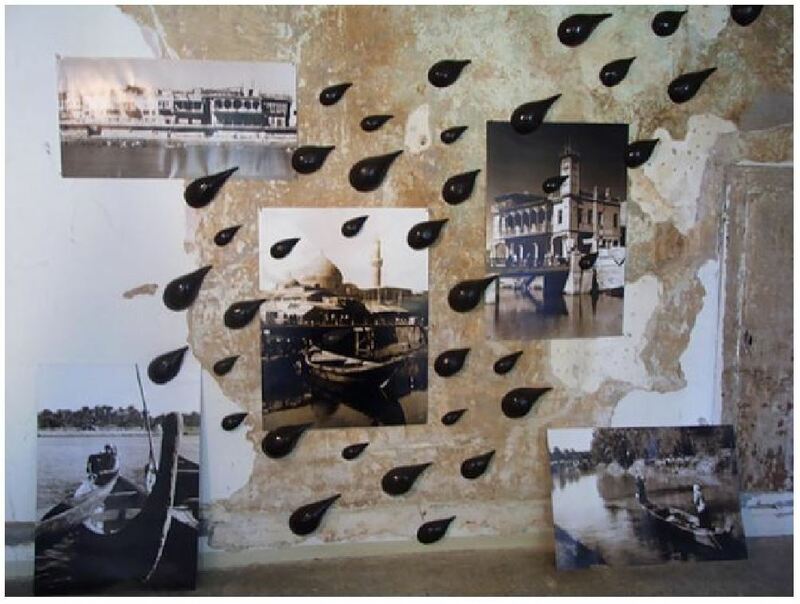 ‘Hatoum’s Drowning Sorrows distinctly exemplifies the “exile” Said denotes above. Drowning Sorrows displays the pain and beauty of being an exile without overtly supplying the tools with which to unhinge the paradox attached to it. 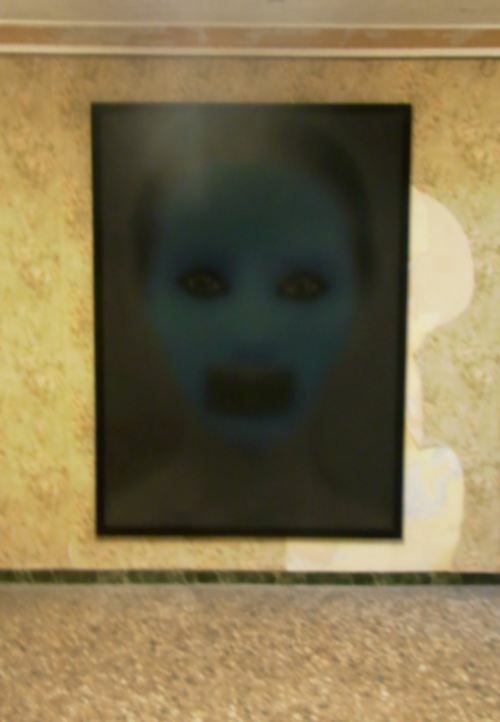 It creates suggestive effects which ultimately lead the viewer towards its paradoxical ambiance. 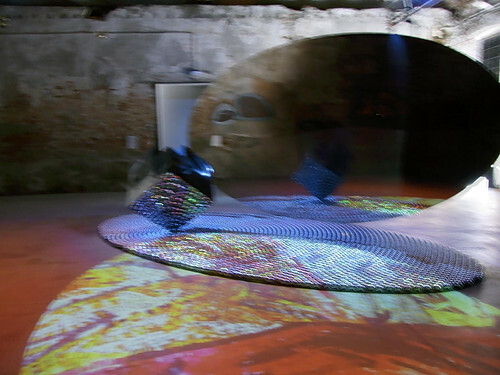 The work contains a circle of glass pieces drawn on a floor. 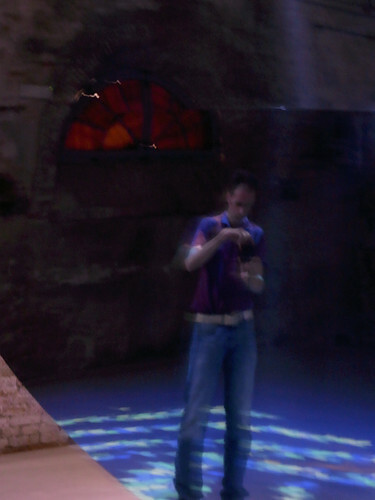 The circle is made up of different shapes of glass flasks and, as they appear on the floor, it seems that the circle holds them afloat. The disparately angled glasses imply cuts from their sharp edges and their appearance is associated with a feeling of pain from the cut. 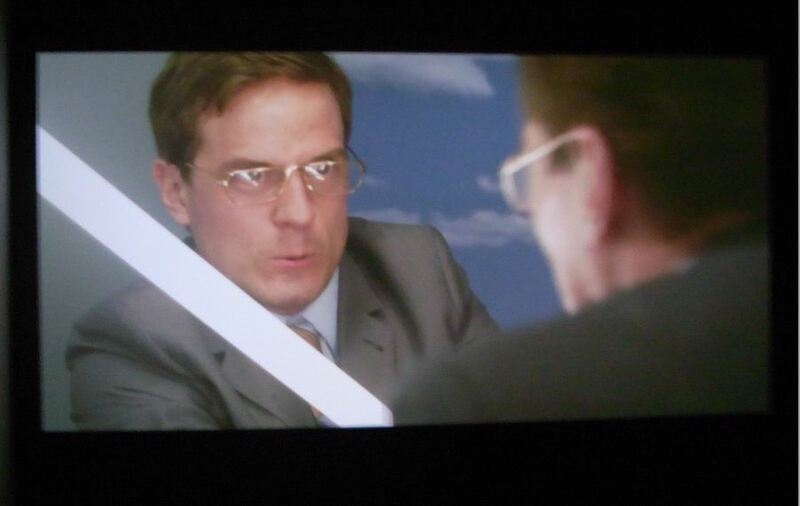 This circle of glasses, therefore, signifies an exilic ache and embodies an authority to “figure” and “plot” the pain’. The work signifies the reality of being unmoored from a fixed identity as the flasks are ambiguously put on a ground where they are perceived to be ungrounded. The appearance of the glasses is also unusual—we do not get to see their full shapes. As the artist’s imagination endows them with a symbolic meaning, they have been cut in triangular and rectangular forms of different sizes. These varieties of cut glasses speak of an undying pain that the exile suffers. In an exile’s life, irresolvable pain comes from dispossessions, uncertainty, and non-belonging. Being uprooted from a deep-seated identity, an exile finds him/herself catapulted into a perpetual flux; neither going back “home” nor a complete harmony with the adopted environment through adopting internally the “new” ideals is easily achievable. There exists an insuperable rift between his/her identity and locales which both are nevertheless integral parts of their identity. 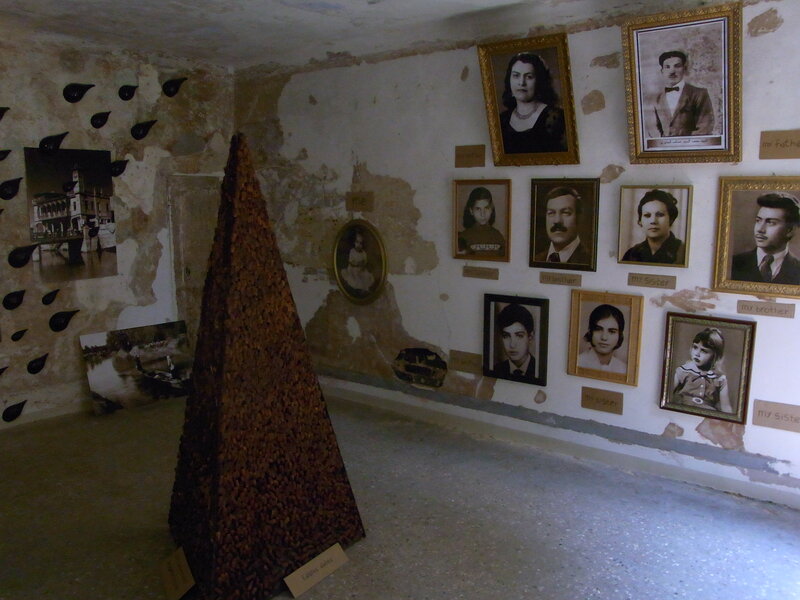 Hence, Hatoum portrays the exilic “identity as unable to identify with itself,” as Said puts it. However, the glass edges above also represent that an exile’s experiences are nonetheless beautiful and worthy of celebration. 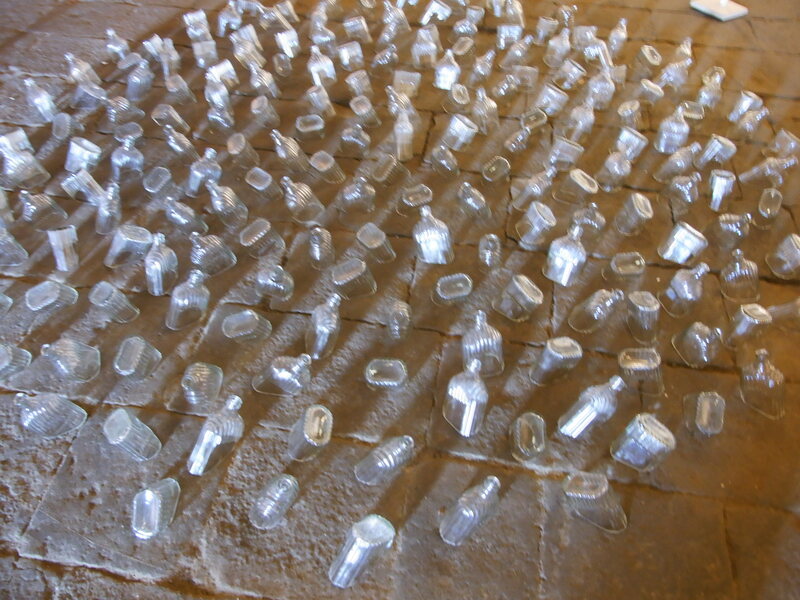 The glass pieces show the experiences that an exilic traveller gathers in the journey of life. The journey is all about brokenness and difference. But an exile’s life becomes enriched in many ways by being filled up with varieties of knowledge and strengths accrued through encountering differences. 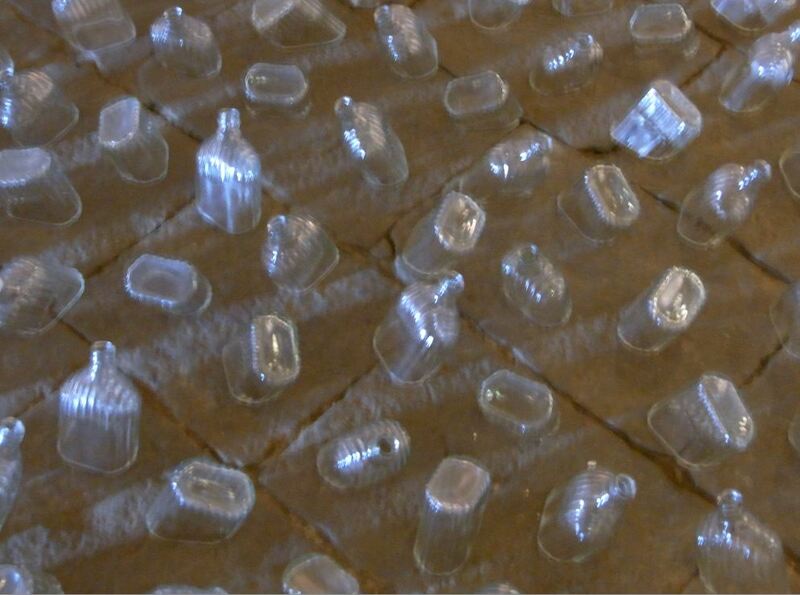 Hatoum’s creation, therefore, befittingly captures these benefits by transferring them into an art work that bewitches the viewer through an unknown beauty. 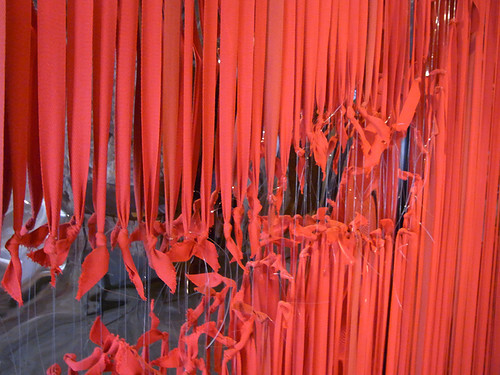 Being an expression of beauty, the art work is transformed into a celebration of “exile.” Despite “Drowning” in “Sorrows,” Hatoum’s work demonstrates an authority to give vent to the exilic pain through a work of beauty. Ultimately, we see that an exile is not entirely drowned by the sorrows of loss. Notwithstanding the anguish, the exile gains the privilege to explore the conditions that create the pain; because the painfulness zeroes in on the very nature of identity formation. The exile has the privilege of reflecting on the reality surrounding his/her identity. Therefore, Hatoum’s glasses are not pieced together purposelessly; they depict the ambiguity that the exile feels towards identity. Her creative ambiguity makes us both enjoy the art and question the reality which we ourselves, exiles or not, find ourselves in. “Drowning Sorrows” shows a way to question the reality by being ambiguous towards it. Hatoum thus transmutes her exilic pain into a work of imagination which becomes an emblem of her artistic power through such suggestiveness. From this point of view, Hatoum is an exemplary Saidian “exile” as she turns the reality of being uprooted from “home” into an intellectual power against the systematisation of identities. In Orientalism, Said distinguishes the dividing line that severs the supposedly superior Western culture from the ostensibly inferior one of the “Others.” He examines the modus operandi of such a disjunction. 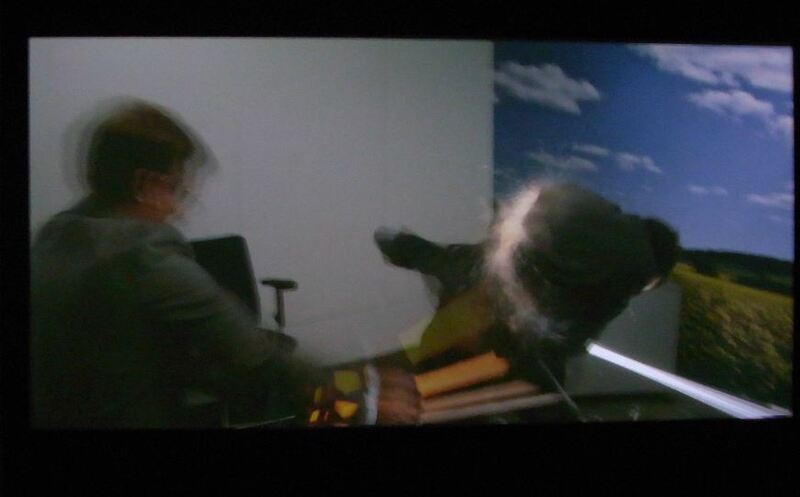 He studies power-structures to reveal how they dissociate cultures. Thus the Saidian “exile” develops independent criticisms of cultures in order to defeat the debilitating effects of discursivity that disconnect cultures. The “exile” thus sees the whole world as a foreign land captured in the power-knowledge nexus’. 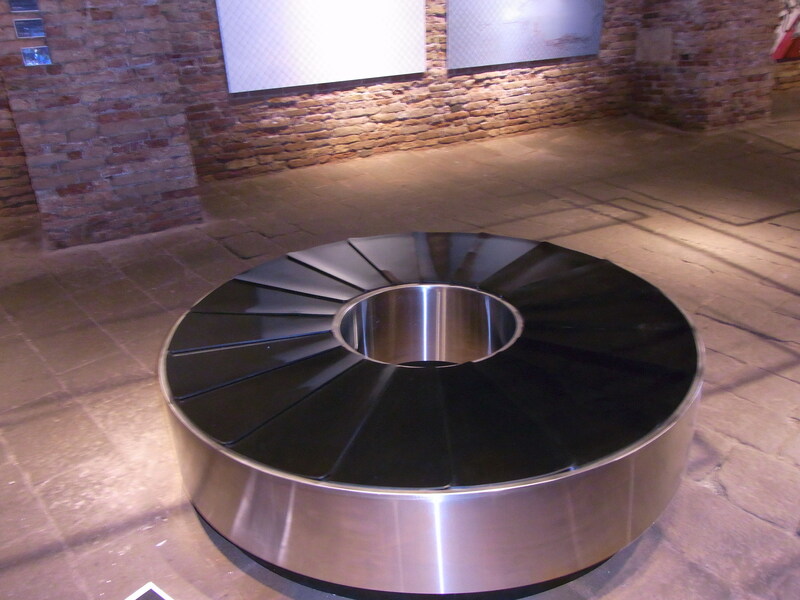 Embrace is a circular, motorised sculpture fabricated to look like an empy luggage conveyor system found in airports. 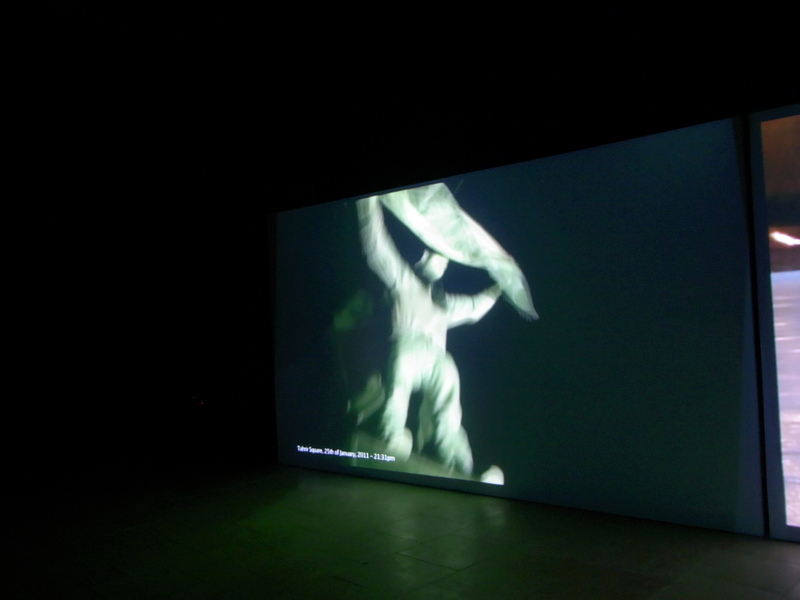 It remains perfectly still and quiet, but when a viewer comes near the sculpture their presence activates the work; it turns on and starts moving. 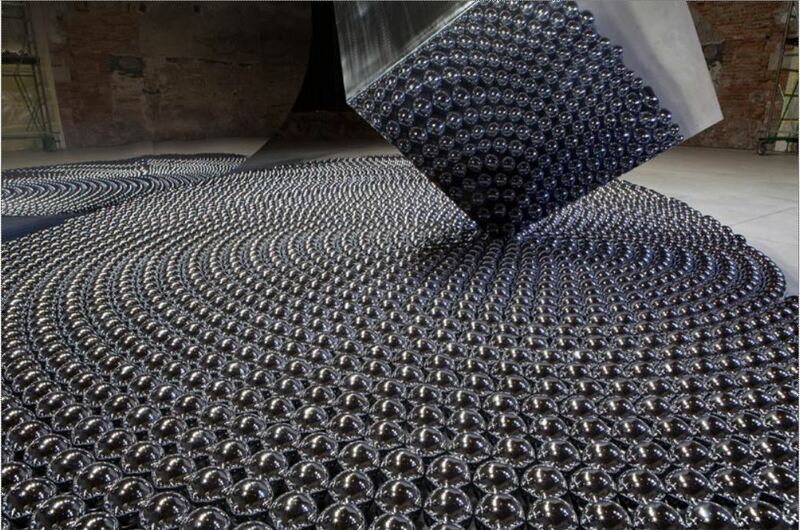 The work’s diameter refers to the height of the artist. 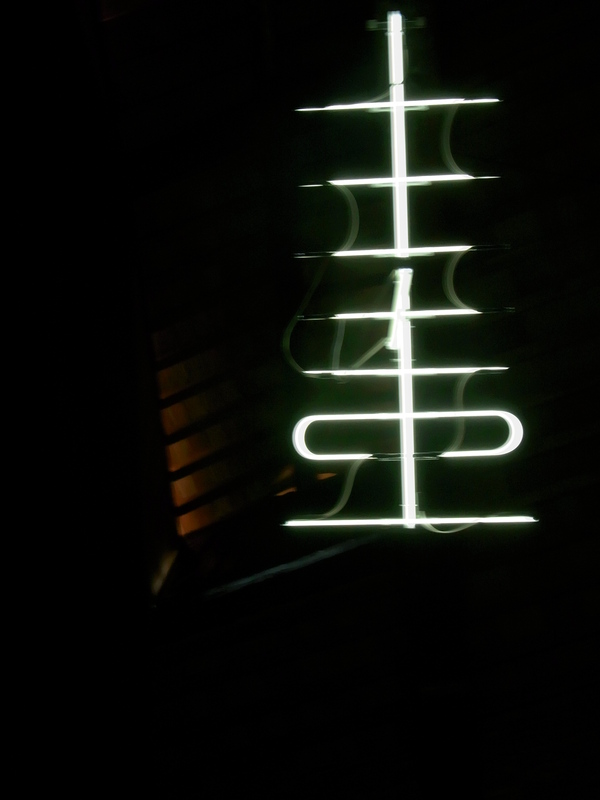 The work symbolizes, amongst many things, waiting and the etymology of the word ‘embrace’. (in Robert Goff, Cassie Rosenthal, Ahmed Alsoudani, Hatje Cantz Verlag, Ostfildern, Germany, 2009). The Aesthetics of Disappearance: A Land Without People – Jananne Al-Ani from Sharjah Art Foundation on Vimeo. 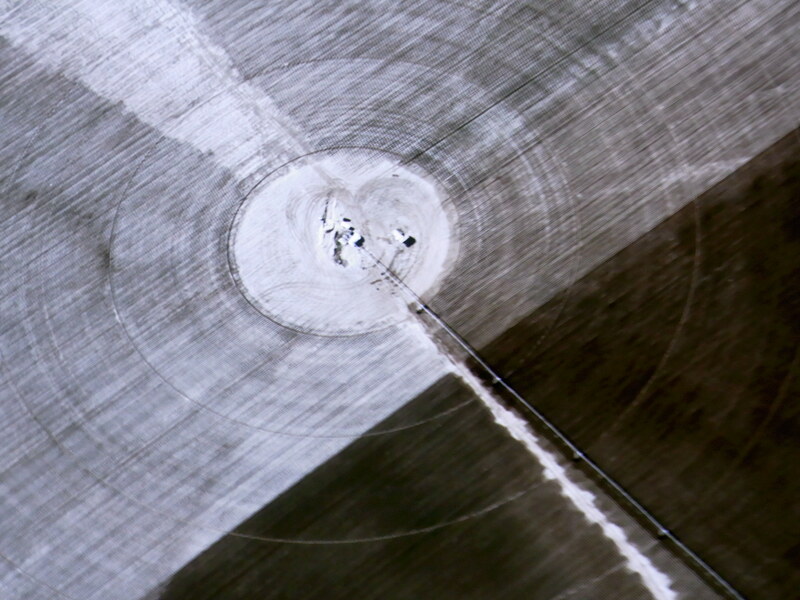 ‘Shadow Sites II is a film that takes the form of an aerial journey. It is made up of images of landscape bearing traces of natural and manmade activity as well as ancient and contemporary structures. Seen from above, the landscape appears abstracted, its buildings flattened and its inhabitants invisible to the human eye. Only when the sun is at its lowest, do the features on the ground, the archeological sites and settlements come to light. 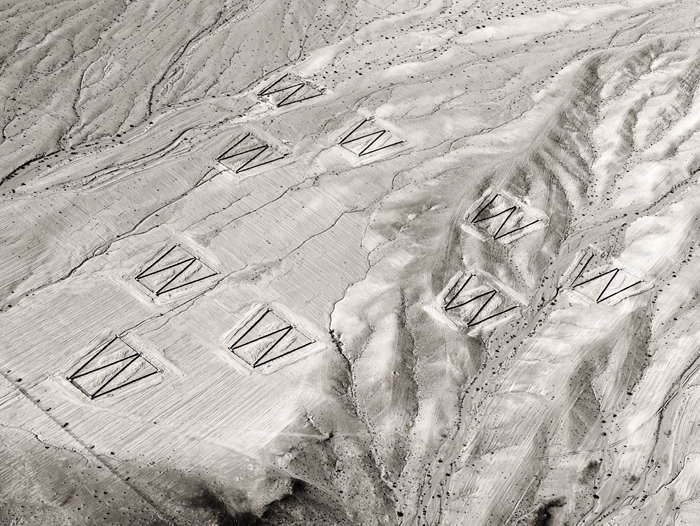 Such ‘shadow sites’ when seen from the air, map the latent images by the landscape’s surface. Much like a photographic plate, the landscape itself holds the potential to be exposed, thereby revealing the memory of its past. Historically, representations of the Middle Eastern landscape, from William Holman Hunt’s 1854 painting The Scapegoat (see http://en.wikipedia.org/wiki/The_Scapegoat_(painting), FS) to media images from the 1991 Desert Storm campaign have depicted the region as uninhabited and without sign of civilization. 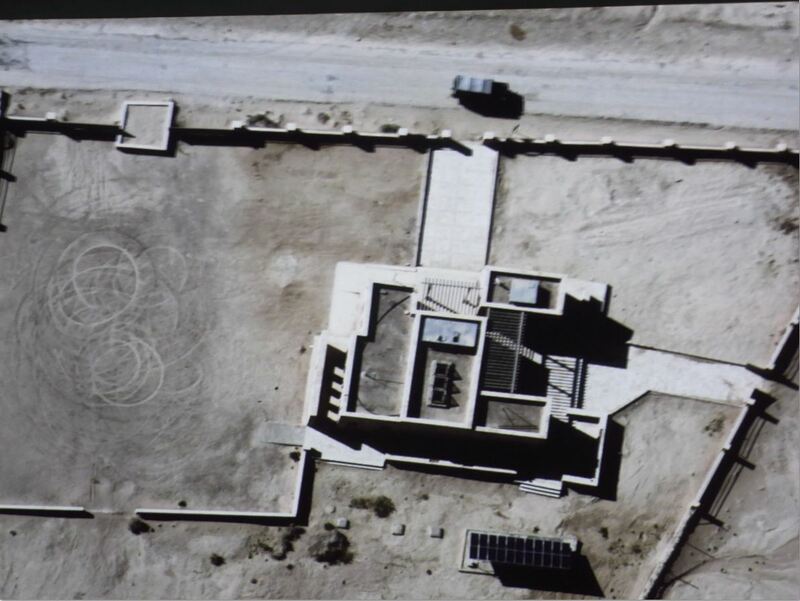 In response to the military’s use of digital technology and satellite navigation, Shadow Sites II recreates the aerial vantage point of such missions while taking an altogether different viewpoint of the land it surveys. 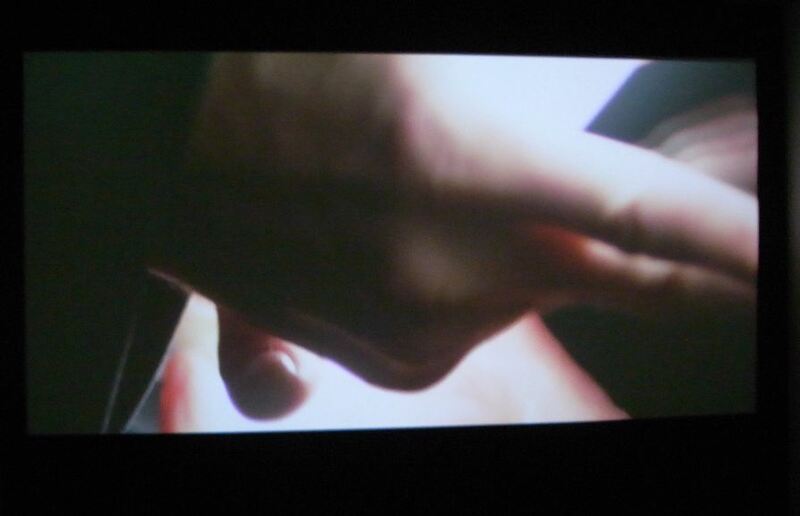 The film burrows into the landscape as one image slowly dissolves in another, like a mineshaft tunneling deep into substrate of memories preserved over time’. television antennas up to the sky. I don’t know any other way”. 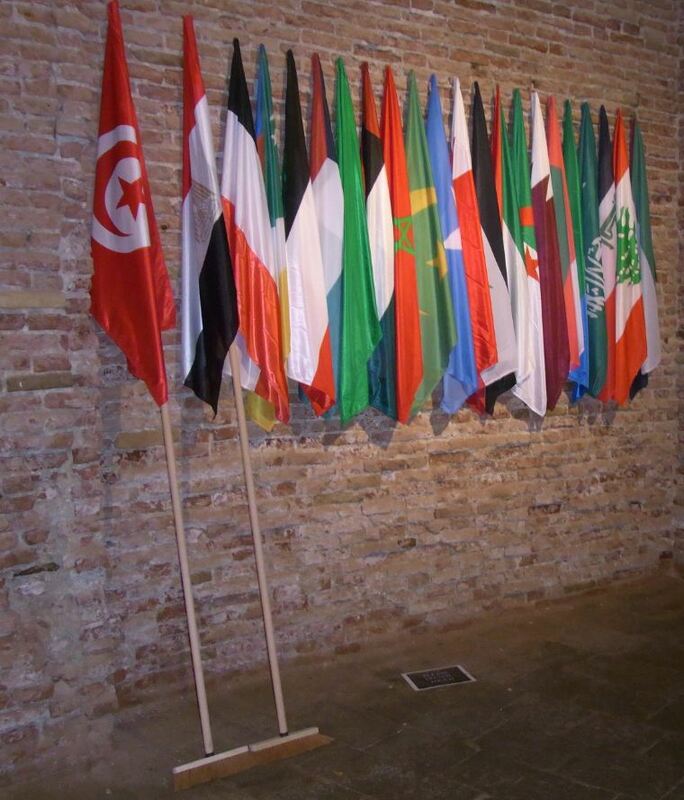 ‘The lost Springs, Mounir Fatmi’s minimal installation, displays the 22 flags of the states of the Arab League at half mast. In the Tunisian and Egyptian pavilions, two brooms refer to the upheavals that led to the fall of President Ben Ali in Tunisia and President Mubarak in Egypt. This evocative, subtle and trenchant work of art has been inspired by the current protests against neo-patriarchal powers in the Maghreb, the Mashriq and the Arabian Peninsula. In the anthropology of the state, the flag is a symbol rich in identity and attribution. It is a part of a secular liturgy which establishes a holy space for the politically sacred. 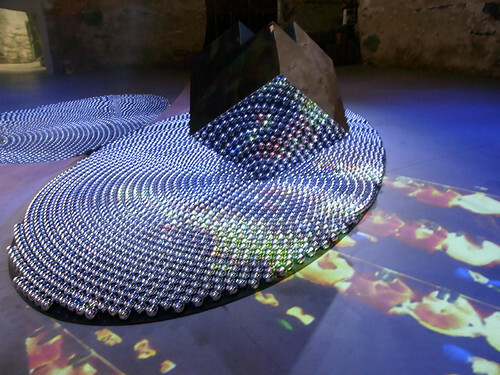 Mounir Fatmi seems to have captured this with his intuition of an iconic device halfway between the altar and the universalizing official dramaturgy. 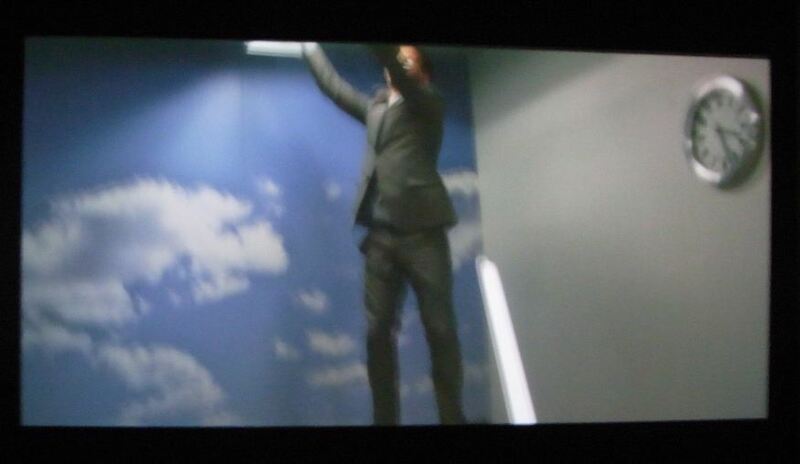 He gets to the core of democratic representation, on the capacity to metaphorically catalyse the civil link. There is a touch of the domestic in his contemporary heraldry. The necessary cleansing that Mounir Fatmi suggests does not concern the community but rather the dictators who dream themselves as demiurges. It calls for action-creation. The Brooms ironically point to some dynamic process and stimulating imitation effect. Who’s next? What else should be dusted? Where has the rubbish been hidden? Though the aesthetics of sweeping, the artist testifies to some timeless spring. A standard bearer of the pan-Arabic revolutionary revivalism and its enchanting Utopia, he breaks away from the prevailing monotony of always disenchanted tomorrows, irreverently using the devices of complicity through self-sufficient references, and blurring the familiar novel and popular romance. 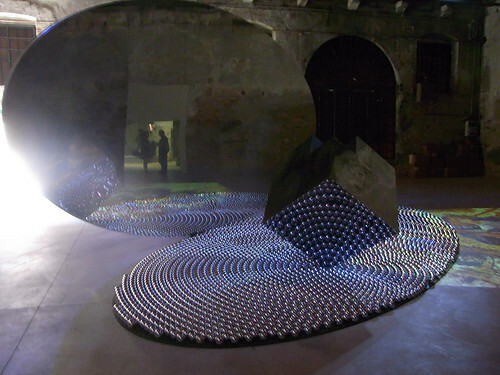 Giving his work an essential and symbolic function, he dematerializes it, as if to repeat over and over again that symbols are food for thought’. From ’The Future of a Promise’. ‘My relationship with the urban environment is reciprocal; streets and the cities inspire a particularly critical reaction. As a socially engaged artist, I need to take back to the people, to the city, to the built environment. 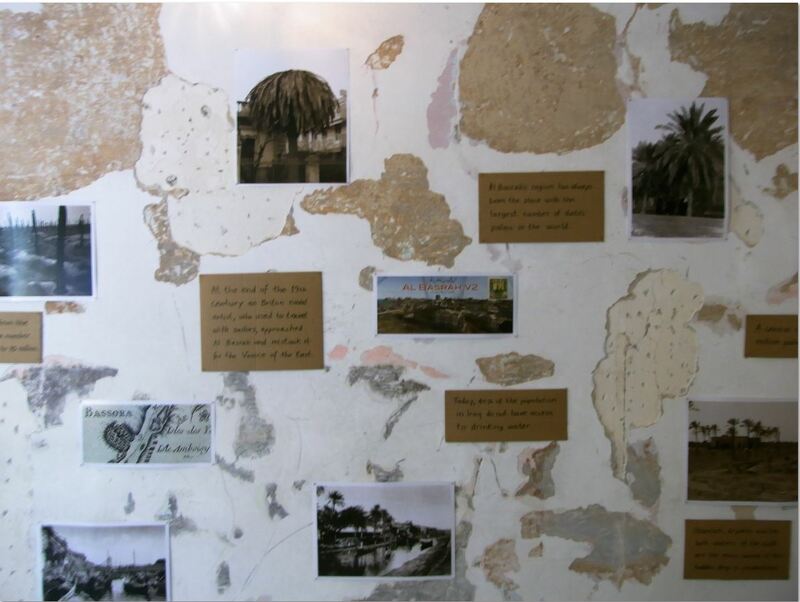 In previous works I have related the story of social environments marked for destruction, regardless of the fate of the people who live in it, or of disaster arising from a misplaced trust in the security of concrete. With the current work, I turn my attention to the false promise of the manufactured modern city. Viewing 3D models for the future cities springing up across the Gulf, focuses attention on the disjunction between the apparent utopia of the future they appear to offer and the daily, complex and problematic reality of our actual urban lives. These cities can be a distraction, a vehicle exploited by bureaucracies who wish to divert the attention of a sophisticated population away from a reality which is not model. Through the use of stamps, I underline the inevitable stultifying and complicating effect the bureaucracy will have, even as it works to build its vision for a better society. Why do we look to an utopian future when we have social issues we need to address now? I am not opposed to this brave new world but I want to see governments engage with the streets and cities, and the problems of their people, as they are now. Why built new cities when there are poor people we need to look after? This is a distraction: we should not be afraid to change. 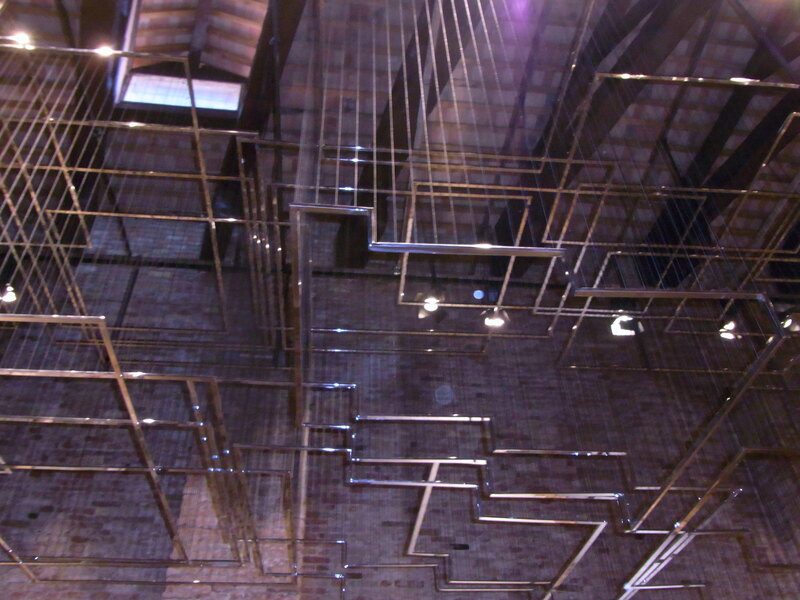 ‘Suspended Together is an installation that gives the impression of a movement and freedom. 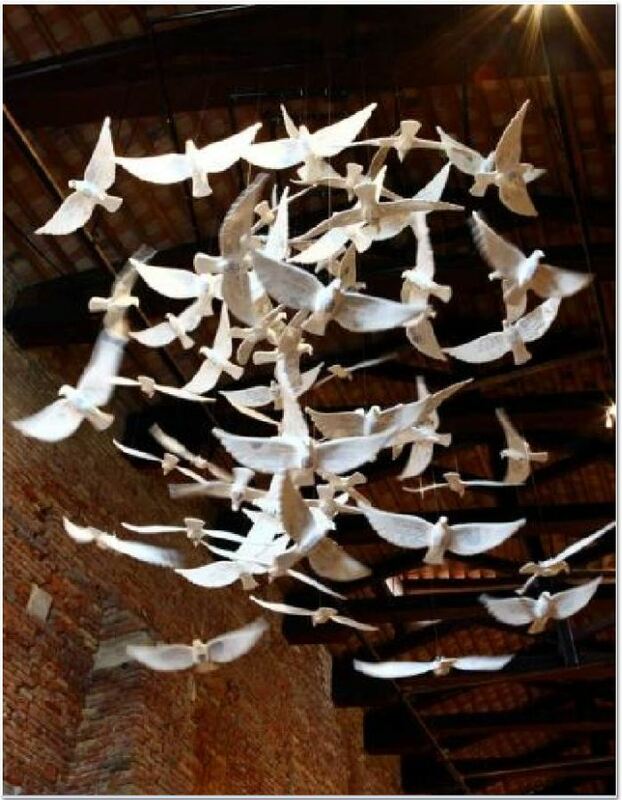 However, a closer look at the 200 doves brings the realization that the doves are actually frozen and suspended, with no hope of flight. 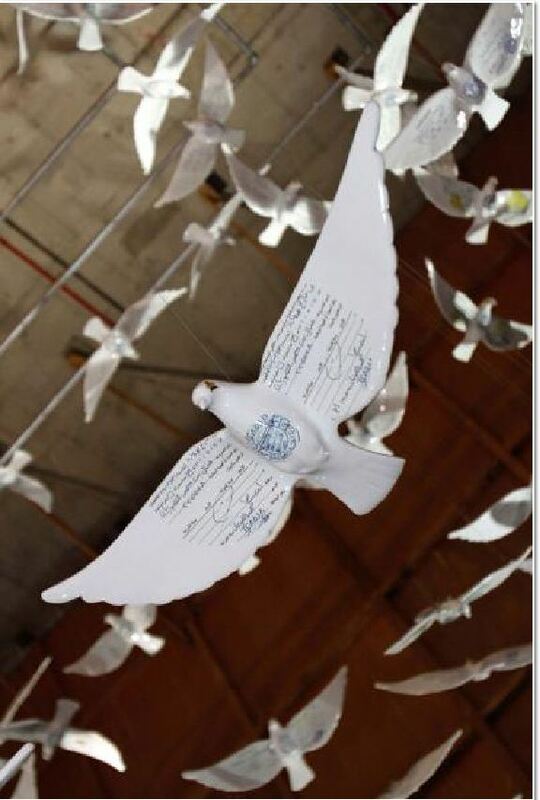 An even closer look shows that each dove carries on its body the permission document that allows a Saudi woman to travel. Notwithstanding the circumstances, all Saudi women are required to have this document, issued by their appointed male guardian. The artist reached out to a large group of leading female figures from Saudi Arabia to donate their permission documents for inclusion in this artwork. Suspended Together carries the documents of award-winning scientists, educators, journalists, engineers, artists and leaders with groundbreaking achievements that contributed to society. The youngest contributor is six months old and the oldest is 60 years old. In the artist’s words: ‘regardless of age and achievement, when it comes to travel, all these women are treated like a flock of suspended doves’. The Flying Carpet is an Oriental fairytale, a dream of instantaneous and boundless travel, but when I visited Venice I saw that illegal immigrants use carpets to fly the coop. They sell counterfeit goods in order to make some money for living. If they are caught by the police they risk expulsion. There was a butcher in Tunis who wanted to honour Ben Ali. His idea was to call his shop ‘Butcher shop of the 7th November’, the day when Ben Ali assumed the presidency in a ‘medical’ coup d’ état from then President Habib Bourguiba. After he did so, he disappeared without a trace. In winter 2010, I visited Cairo, a city which has more citizens than the country I was born. This metropolis is characterized by strong contradictions: tradition and modernism, culture and illiteracy, poverty and wealth, bureaucracy and spirituality. All voices fade through the noisy hustle of this melting pot, but if you risk a closer look on the walls you will find the whisper of the people carved into stone. 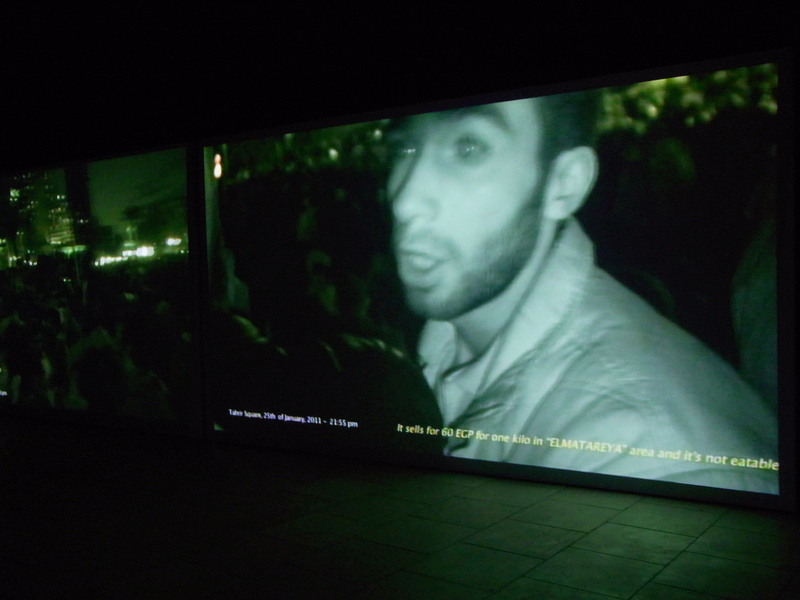 Right: Ahmed Basiony, “30 Days of Running in the Place” documentation footage, February–March2010, Palace of the Arts Gallery, Opera House Grounds, Cairo, Egypt. Left: Ahmed Basiony, 28th of January (Friday of Rage) 6:50 pm, Tahrir Square. Photo taken by Magdi Mostafa. 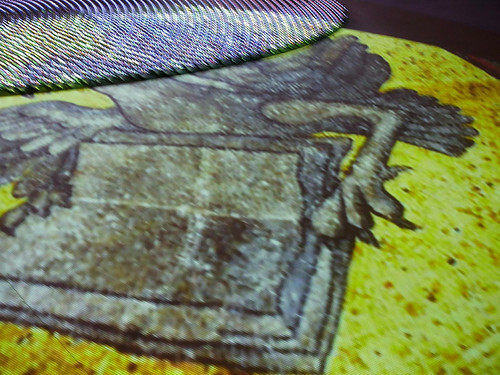 Ahmed Basiony (1978–2011) was a crucial component as an artist and professor to the use of new media technology in his artistic and socio-cultural research. He designed projects, each working in its own altering direction out of a diversity of domains in order to expose a personal account experienced through the function of audio and visual material. 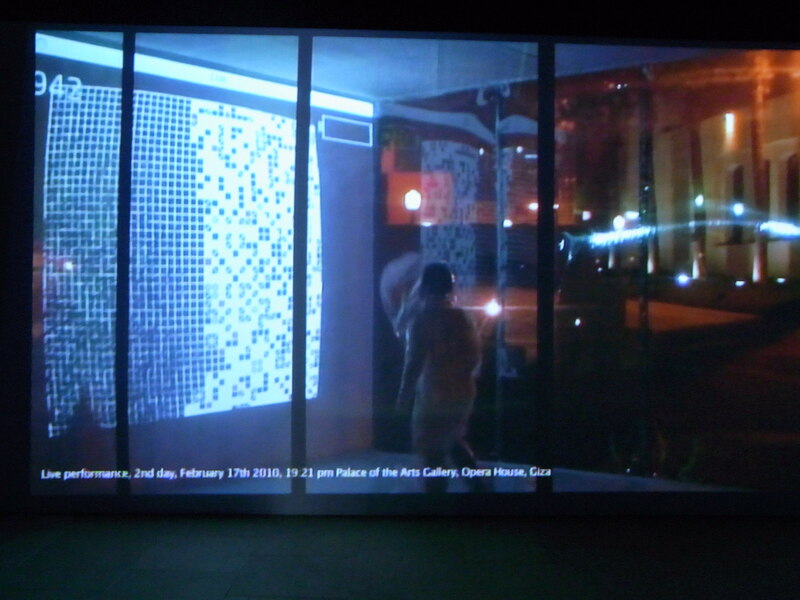 Motioning through his artistic projects, with an accurate eye of constant visibility, and invisibility, while listening to audio material that further relayed the mappings of social information: Whether in the study of the body, locomotion through a street, the visual impact of a scream versus data representation in the form of indecipherable codes. The artist functioned as a contemporary documentarian; only allowing the archival of data the moment it came in, and no longer there after. 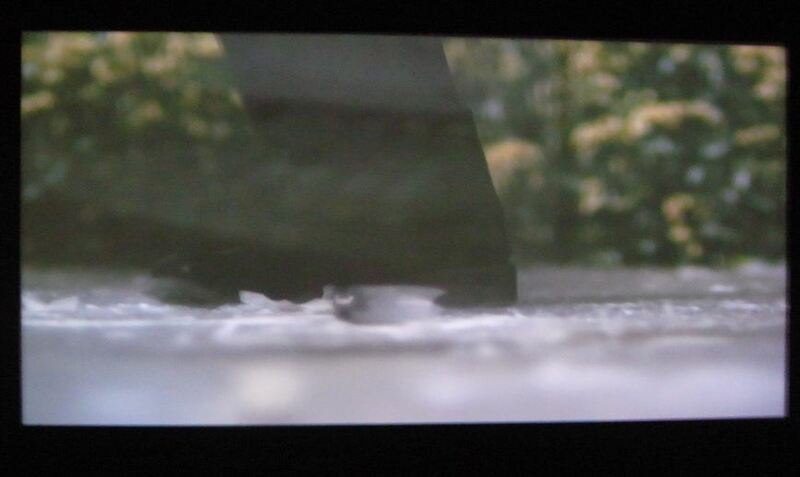 30 Days of Running in the Place is the play of a video documentation to a project that had taken place one year ago. Marking a specific time when the artist had performed a particular demonstration of running, in order to anticipate a countering digital reaction; the aim was to observe how in the act of running in a single standing point, with sensors installed in the soles of his shoes, and on his body [to read levels of body heat], could it had been translated into a visual diagram only to be read in codes, and visually witness the movement of energy and physical consumption become born into an image. One year later, the uprisings to the Egyptian revolution took on Basiony’s attention, as it had millions of other Egyptians motioning through the exact same states of social consumption. 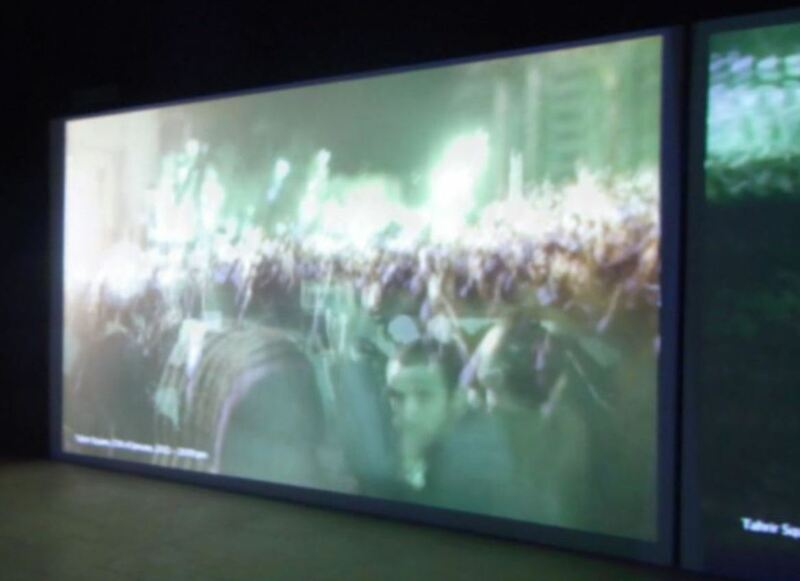 It was from then on, for a period of four days, did Basiony film with his digital and phone camera, the events of downtown Cairo and Tahrir Square, leading to his death on the night of the January 28th, 2011. 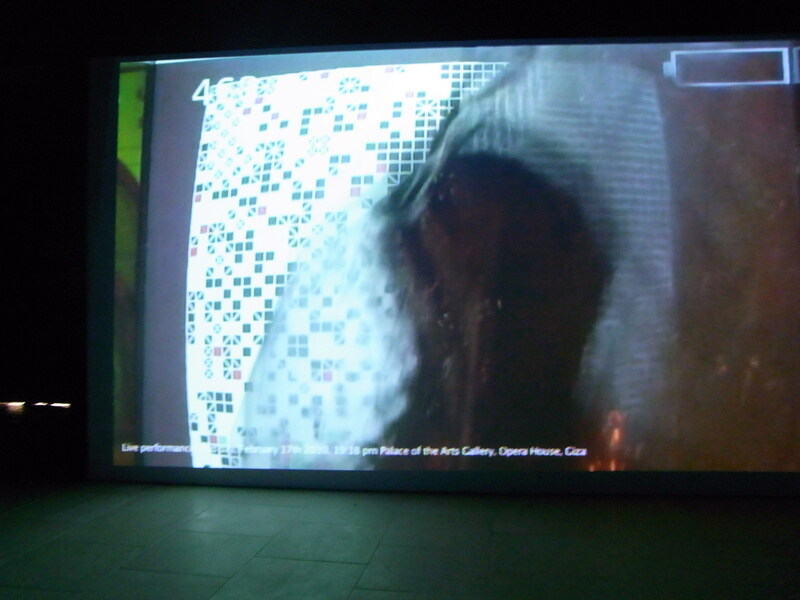 An evolution of universal networks created out of audio, visual and electronic communications, blurring the distinction between interpersonal communication, and that of the masses, Basiony’s works only existed in real-time, and then after that they became part of the archives of research he invested into making. 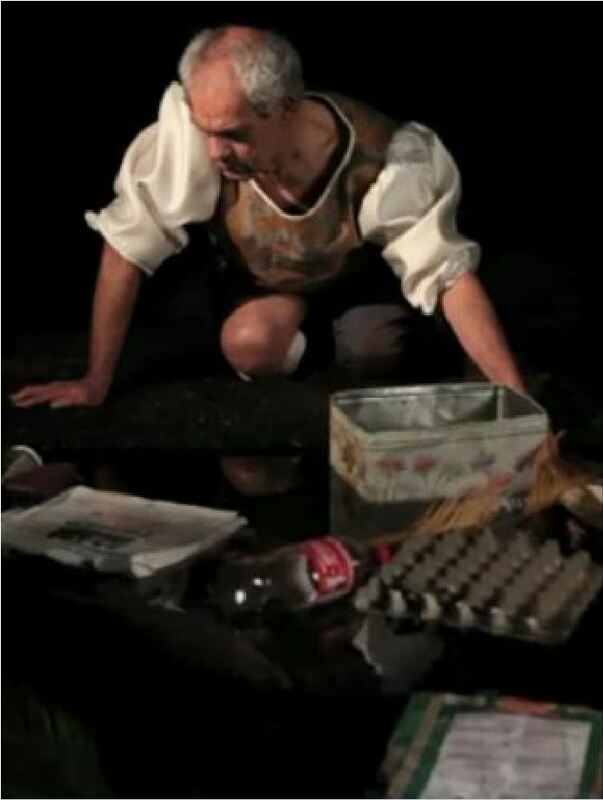 It is with this note, we collectively desired, under the auspices of the Ministry of Culture, to recognize and honor the life and death of an artist who was fully dedicated to the notions of an Egypt, that to only recently, demanded the type of change he was seeking his entire life. A gesture of 30 years young, up against 30 years of a multitude of disquieted unrest. Press Release Abdulaziz Alsebail, Commissioner, is pleased to announce that Shadia and Raja Alem will represent the Kingdom of Saudi Arabia for its inaugural pavilion at the 54th International Art Exhibition – la Biennale di Venezia, Mona Khazindar1 and Robin Start2 will curate The Black Arch, an installation by the two artists. 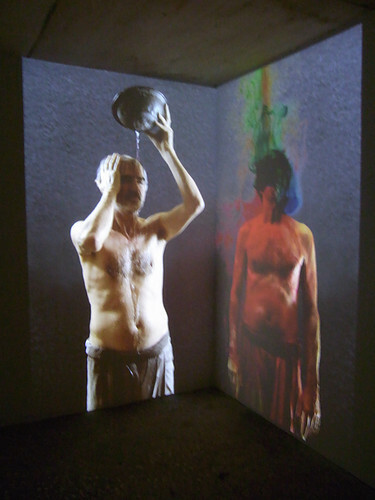 The work of Shadia and Raja Alem can be read as a double narrative. Raja the writer, and Shadia the visual artist, have a non-traditional artist’s background. While having had a classical and literary education the sisters acquired knowledge through their encounters with pilgrims visiting Makkah. Their family had welcomed pilgrims into their home during the Hajj for generations. Since the mid 1980s, the sisters have travelled the world for exhibitions, lectures, and for the general exploration and appreciation of art and literature, and in some way seeking the origins of cultures and civilizations that sparked their imagination through the stories of the visitors to Makkah throughout their childhood. 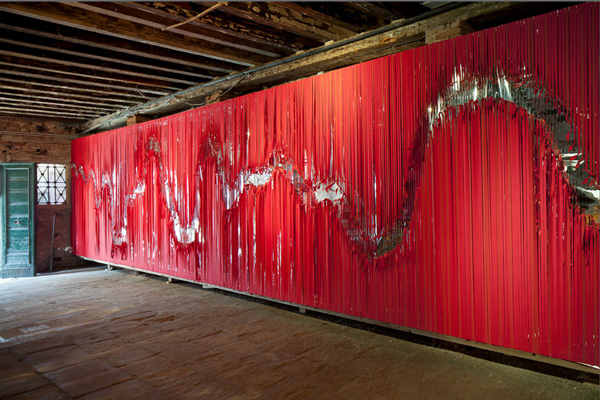 The Black Arch was created through a profound collaboration between Shadia and Raja Alem. 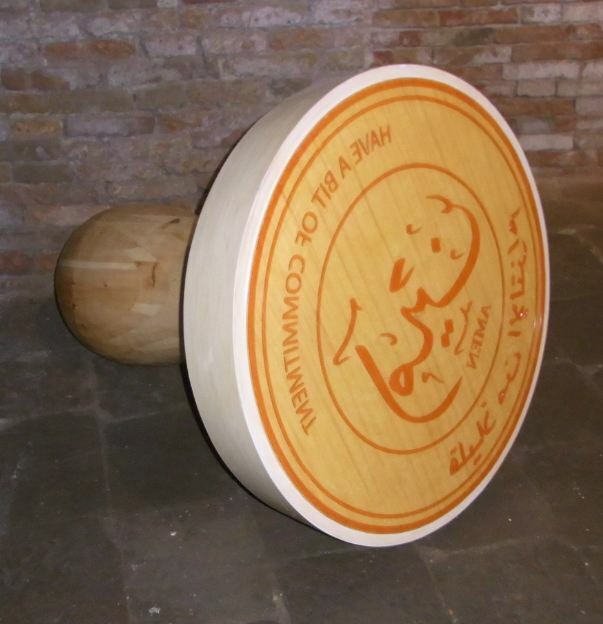 It is very much about a meeting point of the two artists; of two visions of the world; from darkness to light, and of two cities – Makkah and Venice. 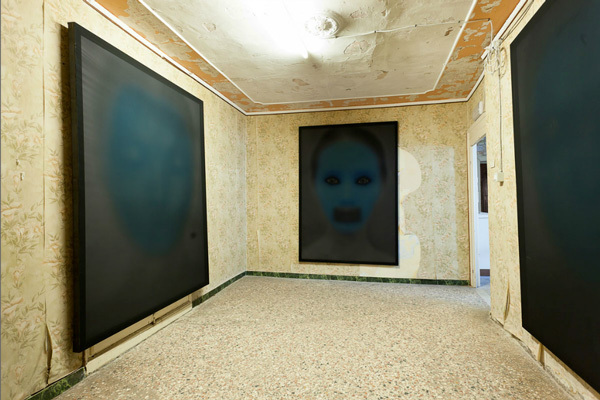 The work is a stage, set to project the artists’ collective memory of Black – the monumental absence of colour – and physical representation of Black, referring to their past. The narrative is fuelled by the inspirational tales told by their aunts and grandmothers, and is anchored in Makkah, where the sisters grew up in the 1970s. The experience with the physical presence of Black, the first part of the installation, is striking for the artists; Raja explains, “I grew up aware of the physical presence of Black all around, the black silhouettes of Saudi women, the black cloth of the Al ka’ba3 and the black stone4 which is said to have enhanced our knowledge.” As a counter-point, the second part of the installation is a mirror image, reflecting the present. These are the aesthetic parameters of the work. The Black Arch is also about a journey, about transition; inspired by Marco Polo and fellow 13th century traveller Ibn Battuta5 – both examples of how to bridge cultures through travel. Shadia explains how she felt a desire to follow Marco Polo’s example and “to bring my city of Makkah to Venice, through objects brought from there: a Black Arch; a cubic city, and a handful of Muzdalifah pebbles.6” The artists focus on the similarities between the two cosmopolitan cities and their inspirational powers. The double vision of two women, two sisters, two artists unfolds in a world of ritual and tradition which, however, confronts the day-to-day reality of human behaviour with simplicity. “If the doors of perception were cleared, everything would appear to man as it really is, infinite.” William Blake. “These are extraordinary times for Iraq. The project to create an official country Pavilion for the 54. 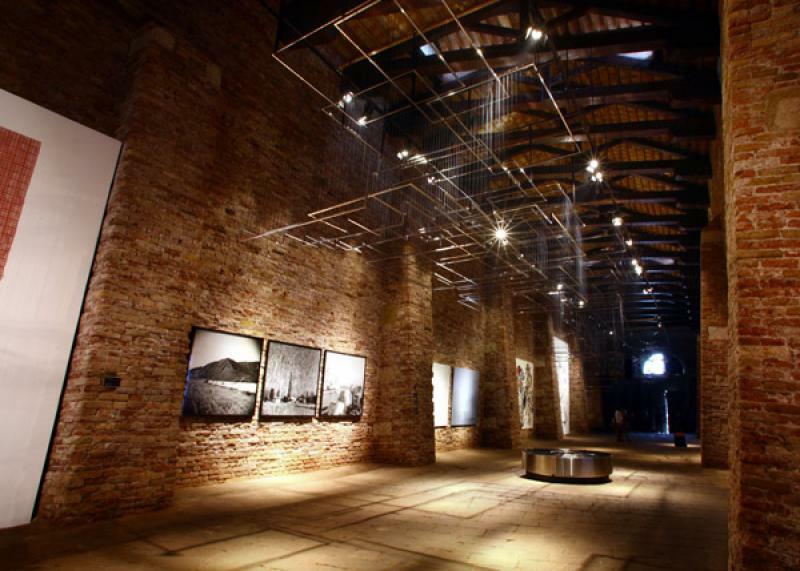 Biennale di Venezia is a multiple and participatory work in progress since 2004. It is historically coming at a period of great renewal after more than 30 years of war and conflict in that country. 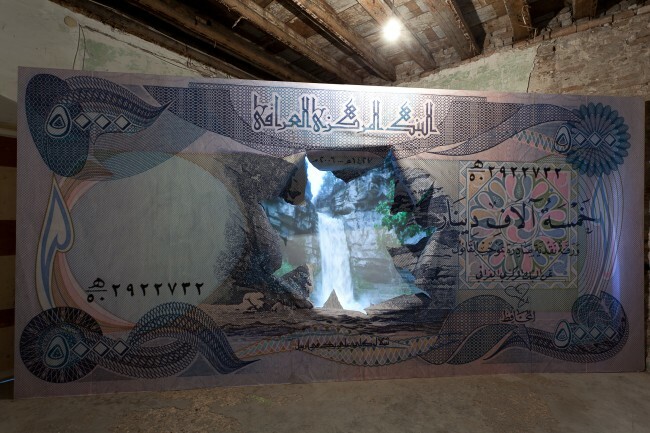 The Pavilion of Iraq will feature six internationally-known contemporary Iraqi artists who are emblematic in their individual experimental artistic research, a result of both living inside and outside their country. 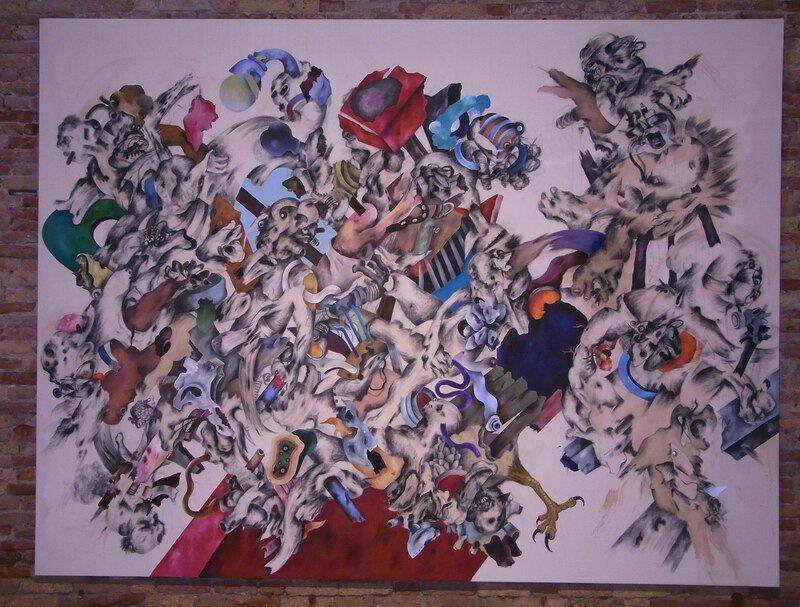 These artists, studying Fine Arts in Baghdad, completed their arts studies in Europe and USA. 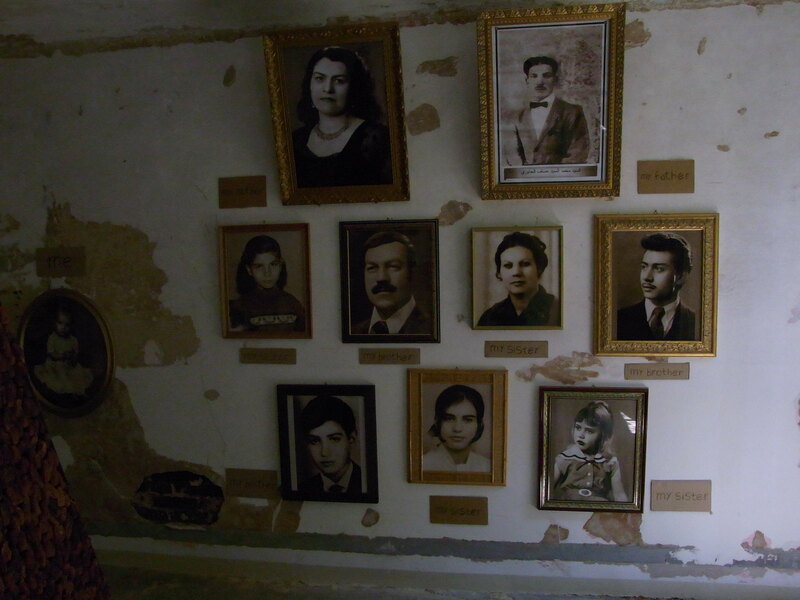 They represent two generations: one, born in the early 1950′s, has experienced both the political instability and the cultural richness of that period in Iraq. Ali Assaf, Azad Nanakeli and Walid Siti came of age in the 1970′s during the period of the creation of political socialism that marked their background. 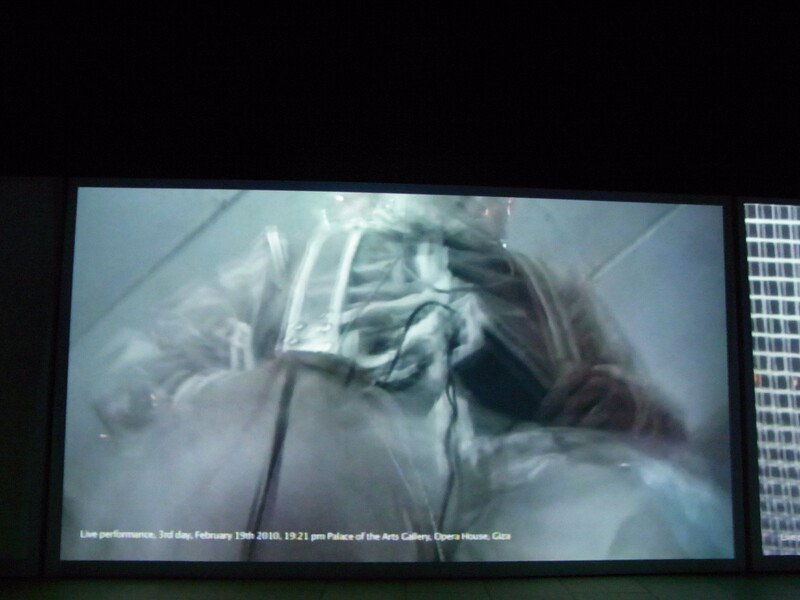 The second generation, to include Adel Abidin, Ahmed Alsoudani and Halim Al Karim, grew up during the drama of the Iran-Iraq war (1980-1988), the invasion of Kuwait, overwhelming UN economic sanctions and subsequent artistic isolation. This generation of artists exited the country before the 2003 invasion, finding refuge in Europe and USA by sheer fortune coupled with the artistic virtue of their work. 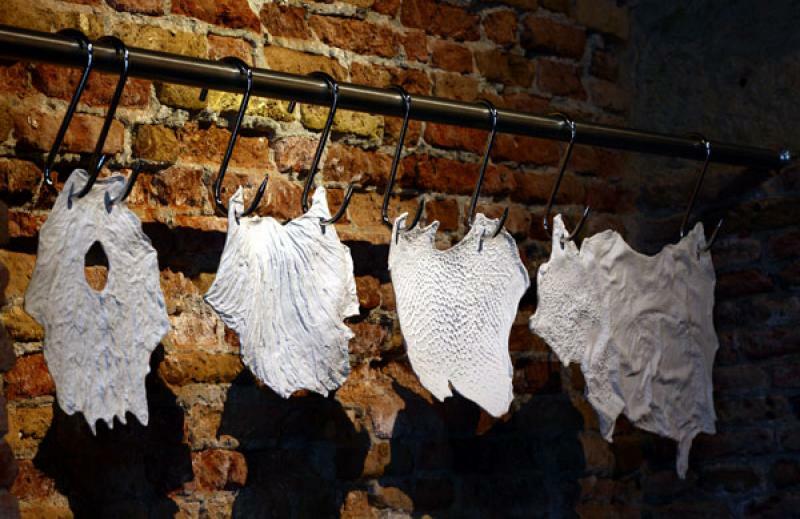 All six artists thus have identities indubitably forged with contemporary artistic practice that unites the global situation with the Iraqi experience and they represent a sophisticated and experimental approach that is completely international in scope. 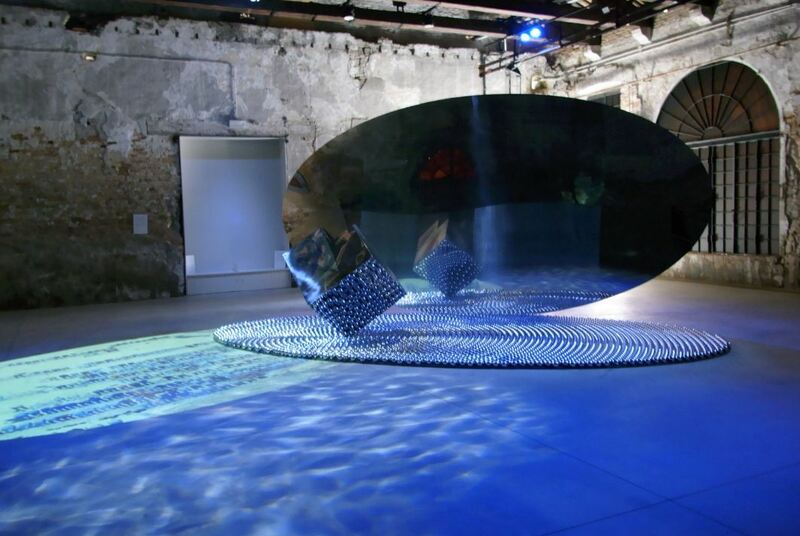 The six artists will execute works on site that are inspired by both the Gervasuti Foundation space and the thematic choice of water. This is a timely interpretation since the lack of water is a primary source of emergency in Iraq, more than civil war and terrorism. A documentary by Oday Rasheed curated by Rijin Sahakian will feature artists living and working in Iraq today. The Pavilion of Iraq has been produced thanks to Shwan I. Taha and Reem Shather-Kubba/Patrons Committee, corporate and individual contributors, Embassy of the Republic of Iraq and generous grants from the Arab Fund for Arts and Culture, Hussain Ali Al-Hariri, and Nemir & Nada Kirdar. Honorary Patron is the architect Zaha Hadid“. ‘In my language Destnuej means ‘purification’, to cleanse the body from all sins. When I was a boy, water for daily use was extracted from wells for drinking, cooking and washing. Long ago the water from the wells was clear and pure, but already at that time, however, things had changed: my friends who lived in the same area suffered from illness linked to contaminated water. My nephew contracted malaria and died. Since then, much has changed and the wells no longer exist. As in most places they were replaced by aqueducts but the problem persists. Residues of every shape and substance are poured incessantly into the water, poisoning rivers and oceans. Toxic waste, nuclear by-products, and various chemicals multiply inexorably, seeping into groundwater. Slowly, day after day, they enter into our bodies. For these reasons, the water is no longer pure. Drinking, cooking, washing. Purifying. Purification is an ancient ritual, disseminated in the four corners of the world. The man who continues to drink this water contaminates his own body. The man who uses it to purify himself contaminates himself. My work is based on and motivated by these themes, which are also linked to general degradation man causes to the environment around us’. ‘Au’ means water in Kurdish. It is present on our planet in enormous quantities. For the most part, however, it is not available for use: it is salt water that makes up our oceans and glaciers. The remaining quantity, which we use for the needs of mankind, might be considered sufficient for the moment, but the resources are not unlimited. The need for water increases in an exponential way, with the rise of the world population, and in a few years time the supply might be in jeopardy. Add to the man’s carelessness and irresponsibility. We waste and pollute water supplies in the name of progress, of consumerism and of economic interests. It is estimated that within the next twenty years consumption is destined to increase by 40%. What’s more, already today a large part of the world’s population does not have access to clean water sources; among them are the people of the Middle East. In ancient days and until a few decades ago, these sources existed throughout the territory. They were called oasis. Today after the building of dams by Turkey in the 70’s and by Syria in the 80’s, and the relentless draining of 15,000 square kilometers of Iraqi land (a decision by the regime) everything has changed: where there was once fertile land, there is now desert and desolation. The World Bank estimates that, by 2035, only 90% of the population of Western Asia, including the Arab Peninsula, will be without water. The small quantity that will still be available will be directed to urban areas, while the countryside will drown in inescapable aridity. The accumulation of refuse of large urban and industrial areas over the years had created further danger and damage to the integrity of its precious resource. Underground water levels are polluted by toxic substances. Non-biodegradable materials from refuse dumps accumulate in canals and oceans. This work emulates the disturbing images from the media of islands composed entirely of accumulated waste. 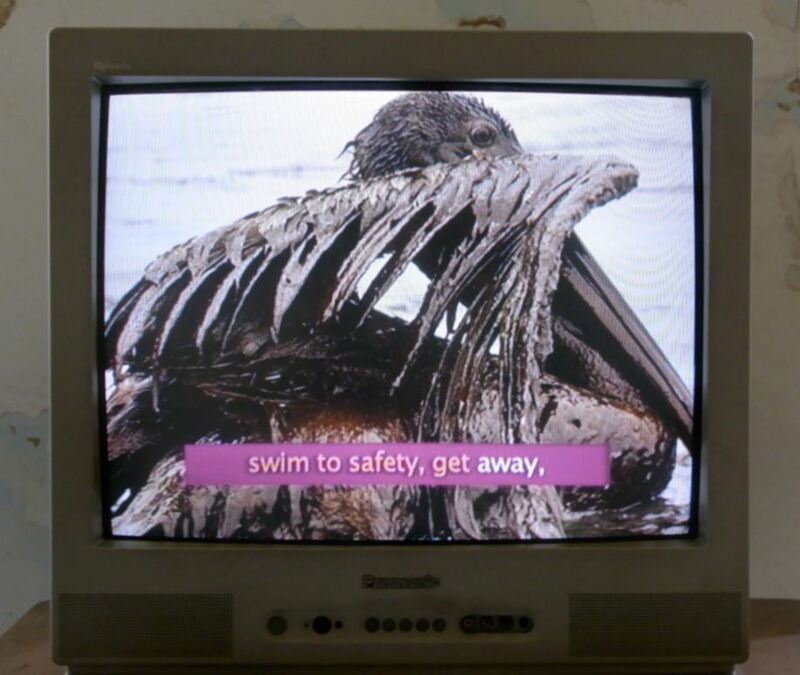 In this video (Nations Laundry), the idea and materials used to reflect the concepts of threat, apprehension, and survival in matters of our environment. Within this work, my aim is to create an awareness that may, in turn, help bring about positive changes to our failing environmental systems that came as a result of yours and our wars. My works dwell on the envolving mentality of urban society. I am concerned with ongoing and unresolved issues, particularly when they relate to violence. I search both through the layers of collective memory and my personal experience in that context. In this process, the main challenge for me is to identify and stay clear of the historical and contemporary elements of brainwash. Through these works I try to visualize an urban society free of violence. These out of focus images, sometimes rendered more mysterious under a veil of silk, imply uncertainty of context, time and place. These techniques, which have become the hallmark of my work, are a means to overcome the effects of politics of deception and, in turn, transform me and the camera into single truth seeking entity. ‘My deepest memories are central to my painting but it is often easier only to look at the surface; to see war, torture and violence and even to consider my art only in terms of the present Iraq war. My own approach is different from anything related to the first impression. I am interested in memory and history, and in the potent areas between the two that enable me to keep memories alive in the present. As an artist, it is important not to get obsessed with my subject matter. I need critical distance. Some of the events that inform my paintings are things I have personally experienced while others I have heard about from family or close friends. These events are refashioned in my imagination in such a way that I am able to look at them both very personally and with some distance. If I were too personal and too literal about these subjects I would be overly emotional and that would negatively affect the work, I would take it into a place which is something other than art. In order for these works to survive as art I need the distance my interior process of distilling my subject matter affords me. In terms of Iraq, I care deeply about the country and the people there. 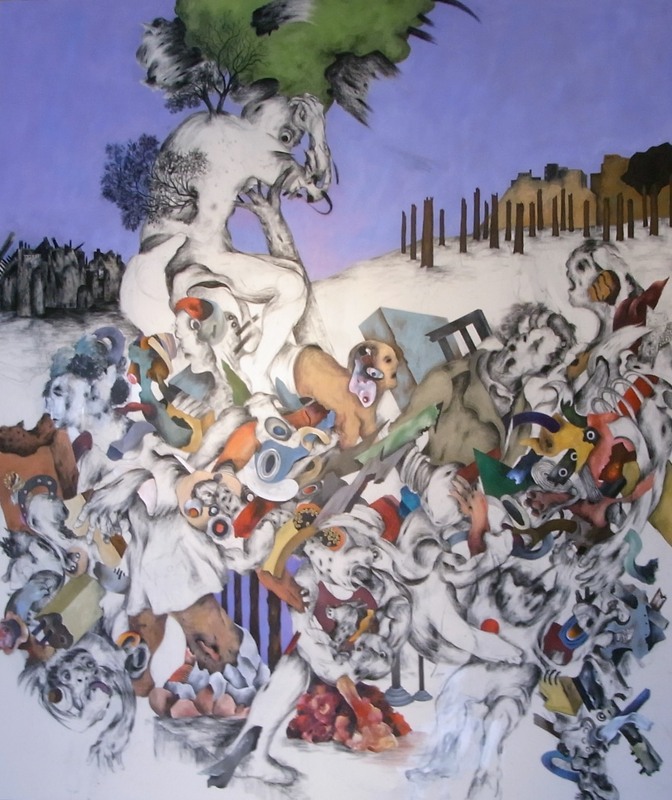 My work is not intended to be a first person account on war, atrocity or the effect of totalitarianism in Iraq in the last twenty years; in fact I think there are universal and common aspects to these things throughout history and different parts of the world and I hope viewers will see this in my paintings in Venice’. The Gali Ali Breg (Gorge of Ali Beg) waterfall is part of Hamilton Road, built in 1932 under the guidance of New Zealand engineer Sir Archibald Milne Hamilton to link Erbil with the Iranian border. The waterfall had long been a tourist destination, featured in Iraqi publications and on the current 5000 Iraqi Dinar note. Two years ago a drought afflicted the region, and left the waterfall dry in the summer seasons. This prompted the Kurdish government to hire a Lebanese company to divert water to the falls, which involved pumping 250 cubic meters of water per second. The imagery on the note thus remained intact. From the air, the Great Zab River near Erbil forms a snaking, green body of water in a dry, golden landscape. Though beautiful, the sight also reveals the skeletons of dried out rivers and streams that once contributed to its flow. This piece exposes the fragility of the Great Zab (one of the main tributaries to the Tigris River), now exposed to the lurking threats of drought, rapid development and political tugs-of-war. 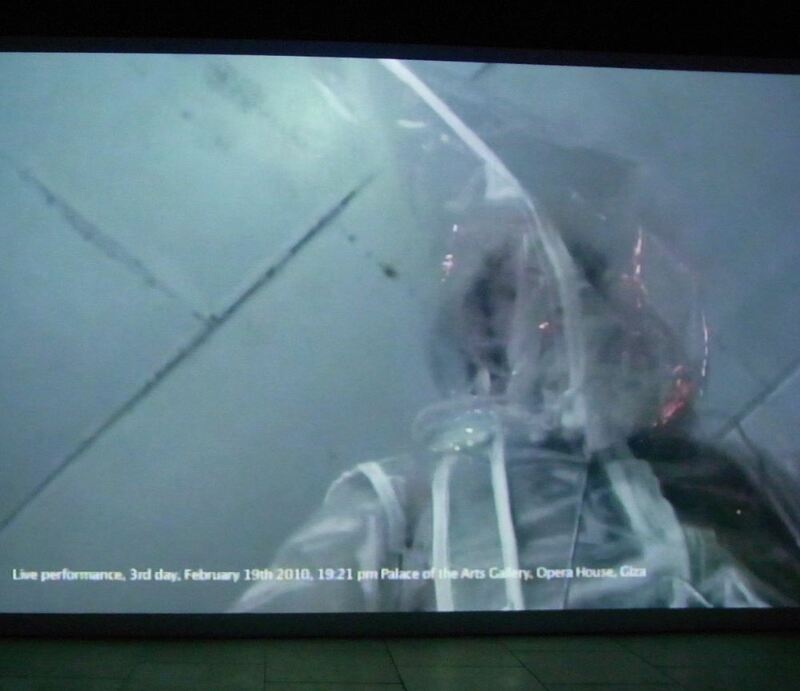 ‘Consumption of War explores the environmental crisis through the participatory crisis and spectator culture of profit driven bodies. Today, global corporate entities encourage consumption on a massive scale for maximum profit, disregarding the obscene amounts of water needed to produce ‘necessities’ such as a pair of jeans or cup of coffee. In Iraq, major corporations have signed the largest free oil exploration deals in history. Yet while every barrel of oil extracted requires 1.5 barrels of water, 1 out of every 4 citizens has no access to clean drinking water. 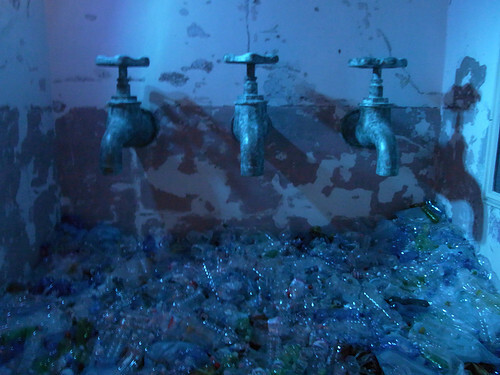 Narciso – Alì Assaf from EcoArt Project on Vimeo. 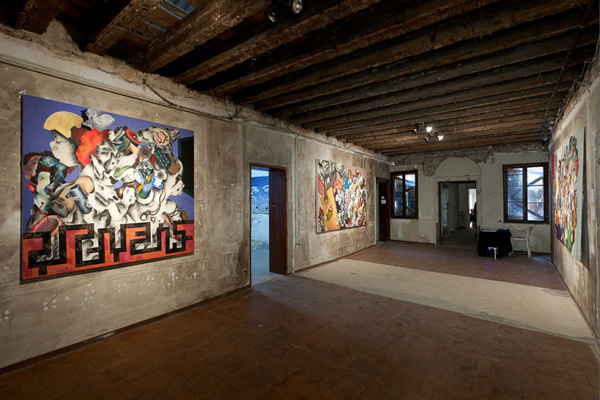 For the 2011 Biennale I have conceived two works. Between them, they approach several aspects following my recent visit to my hometown, Al Basrah, where I lived till the age of 18 and where the majority of my gamily still resides. In this manner my return to Al Basrah had the meaning of reflecting myself in my own history and in its own in-depth and intimate personal identity. But it was impossible to do, because I found this identity led astray and darkened. My arrival at the border between Kuwait and Iraq was a shock. A profound sense of frustration when confronted with this reality. ‘ There was nothing left from those memories that were so important to my survival. Only destruction and ugliness. The surviving friends and family had aged, the Shatt al-Arab River had become saline. The canals had dried up and were a deposit for refuse and garbage, the historic buildings destroyed or substituted by illegal constructions, the dates were contaminated. The Shenashil built of wood (with their Indo-English balconies) were abandoned to their own devices, to the sun and rain, they had lost their charm and characteristic beauty. 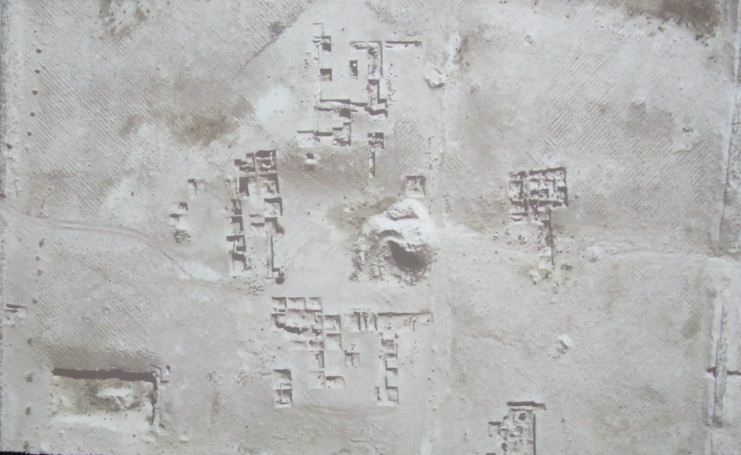 These places were corroded by humidity and lack of care, marked by war and the embargo. All without a trace of poetry.